A corrosive liquid has been thrown over several cars in a Worthing road. 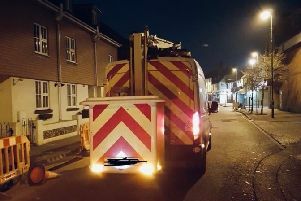 Vehicles in Ringmer Road, Worthing, were damaged by what the fire service described as a 'hazardous substance', which ate through the paintwork and left visible drip marks. A West Sussex Fire and Rescue spokesman said they were called at 12.15pm today and sent one fire engine, and police were also present at the scene. Streaks of the liquid were also seen on the road and pavement. The fire engine crew hosed down the vehicles and the area, and once it was made safe, the incident was left with the owners. The fire crew then left the scene at just before 12.45pm. It is believed that no-one was injured. A police spokesman said they received several calls from the owners of the vehicles.